Prototype: 2 Royal Prussian Railroad Administration (KPEV) Langenschwalbach design branch line cars, from the 3rd production series starting in 1907. 1 type C4itrPr14 as DDi passenger car, 4th class with a baggage compartment. 1 type PwPost4iPr14 as PPipost baggage car with a mail compartment. The cars look as they did around 1916. 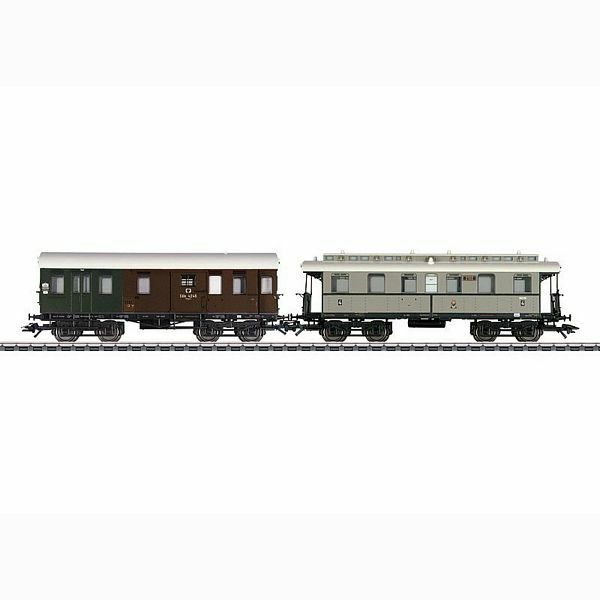 Model: The coach has open end platforms and the baggage car has enclosed crossovers. The trucks are specific to the car types. The cars have separately applied grab irons and crossover plates. The 73400/73401 lighting kit (1 per car) and the 73405 pickup shoe (1 per car) can be installed in both cars. Total length over the buffers 29.0 cm / 11-7/16". DC wheel set per car 4 x 700580. Representation of the gas lighting with containers and ventilation hoods. Comfort on Sharp Curves - In 1889, the sophisticated resort of Langenschwalbach – today Bad Schwalbach – received a rail connection. The line to Wiesbaden had grades of around 3.3% as well as curve radii of a minimum of 200 meters / 656 feet. The Prussian State Railways has passenger cars of a new type built just for this curving right-of-way. Unlike the usual commuter service passenger car designs of that time with almost always two or three rigidly mounted axles, the Langenschwalbach cars were equipped with two-axle trucks. This design turned out so well that they were built from 1892 on for almost 35 years without changes. The 43058 and 43059 passenger car sets together with the 37144 tank locomotive make up a special and yet typical Era I branch line train.